The Lao official said that the LPRP and Lao people congratulate Vietnam on the great achievements that the country has made in all fields over the past 89 years under the leadership of the CPV. She complimented Vietnam’s success in the Doi Moi (renewal) cause which helps Vietnam maintain political stability and speedy economic growth, improve people’s living conditions, and expand external relations. 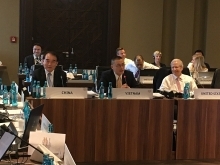 The role of the CPV and of Vietnam has been rising in the region and the world, she noted. Sounthone Sayachac underscored that the Party, State, and people of Laos are proud of Vietnam’s achievements, considering them part of its own and a motivation for boosting the country’s growth. 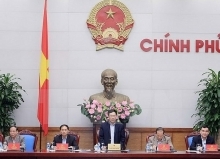 She expressed his belief that under the leadership of the CPV, Vietnam will continue recording further attainments in national construction and development, towards building Vietnam into a prosperous, modern country with happy people, democracy, equality, and civilisation. Noting that the CPV and the LPRP both stem from the Communist Party of Indochina, she said that the partnership between the two Parties has been reinforced in all fields to benefit people of both sides. The LPRP official also showed deep gratitude towards the CPV, the State, and people of Vietnam for great support to Laos over the years. 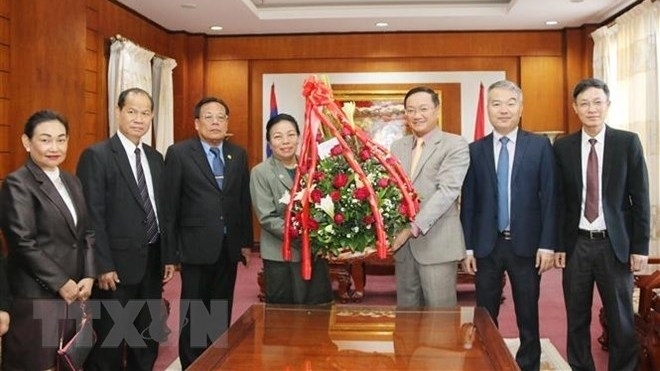 On the occasion of the upcoming Lunar New Year, she also extended New Year wishes to leaders of the Party and State, as well as the entire Vietnamese people. Vietnamese Ambassador in Laos Nguyen Ba Hung thanked the LPRP, highlighting that over the past 89 years, the CPV and the LPRP have shared a close relationship, adding that the LPRP’s support and coordination is a key factor in the development of the CPV. 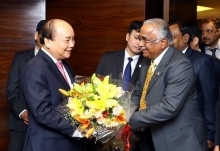 On the basis of the partnership’s strong growth in 2018, Vietnam-Laos ties in 2019 and the future will continue to thrive, stated the diplomat. He also pledged that Vietnam will do its utmost to preserve and reinforce the special solidarity and comprehensive partnership between Vietnam and Laos, creating strong motivation for the national construction and defence of both countries.